Powers/Abilities: The Snake Men had some degree of superhuman strength (enhanced human) and durability, though they were poikilotherms ("cold-blooded"), meaning their body temperature and metabolism fluctuated with the ambient temperature. In cool or cold weather, they became sluggish or dormant. Some of them wore thermal packs to help them maintain warm body temperatures in cooler environments. They didn't seem to react to pain, having to receive nearly fatal injuries before stopping. Traits: The Snake Men in Washington, DC thirsted for more water, to further their transformations, and desired warmth and food. They sought to bite or squeeze others to kill their prey for easier consumption. They were generally quite violent and relatively mindless, guided only by their serpentine instincts, as well as a desire to hurt others. Further, they sought to remove the arms and legs of others so that all things would crawl on the ground. The DC Serpent Men required regular ingestion of the Slither serum to maintain their forms. They would metabolize the Slither serum and gradually return to normal, though strenuous exercise could hasten their metabolisation of the serum, which was at least partially excreted in perspiration. The second generation Snake Men were mutated by intravenous injection of a modified Slither serum. While similar in behavior and desires, they were able to follow orders of the Viper. 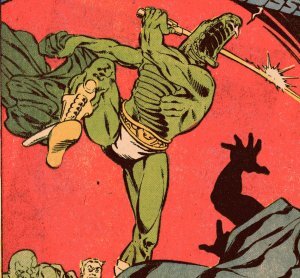 The Snake Men varied in form, with Viper's agents being more-like humans with a few serpentine features, while some of those serving Tyrannus were virtually identical to the Sligguth-spawned Serpent Men -- it might be speculated that these were in the latest stages of mutation. Some of the latter were armed with swords. 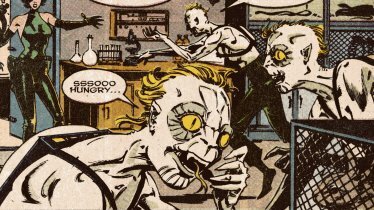 The earliest effects of the Slither serum cured every kind of chemical addiction, while in the final stages those subjected to it became the Snake Men. (Captain America I#342 (fb) - BTS) - The nihilist Viper used serum from the serpentine mutant Slither to develop a chemical that would mutate humans into serpentine-humanoids. (Captain America I#342 - BTS) - Viper sent Serpent Society members to begin loading tanks containing (unbeknownst to them) the Slither serum into the Serpent Saucers. (Captain America I#343 - BTS) - Via a saucer flown by Cobra, Copperhead, and Boomslang, Viper's Slither-ized water made it into Washington, DC's drinking water and was consumed by many, including the POTUS (Ronald Reagan at the time; topical). The allies of the Captain (Steve Rogers, who had given up his Captain America identity) learned of this from Slither and reported the contamination, but were too late to stop it. 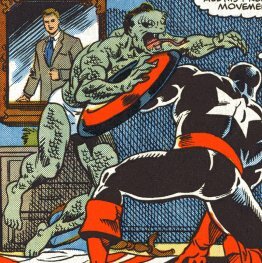 (Captain America I#344) - The POTUS and all those who drank the contaminated water mutated into Snake Men who rampaged throughout the district. The Captain and Nomad (Jack Munroe) tried to keep the violence of the maddened Snake People under control, while Cobra and others were baffled by the mutations, as they had thought that it was just a poison they had added to the water supply. When Nomad fought the Snake Men, Cobra hurled an explosive in his face that stunned him, allowing the Snake Men to overwhelm him. Enjoying the mass chaos she had engineered, Viper fired guns and other energy weapons, killing people and blowing things up as she saw fit. In the White House, shooting through anyone who got in her way, and ultimately ran into the serpentine POTUS and First Lady. She gave the POTUS more water, exacerbating his mutation, and she sent him against the Captain when he arrived. Overcome with pleasure at the sight of Captain America battling the POTUS, Viper merely watched and taunted him with her plans to do the same to the rest of America, but she was forced to flee when another squad of Secret Service men arrived. Captain America tried in vain to get through to the serpentine POTUS, but as he fought defensively to keep the POTUS from hurting him or himself, the POTUS sweated out the Slither serum and eventually returned to normal...though he retained fang teeth for at least two days later. The Viper was taken out by the Cobra, who turned her over to the Captain in vain hope of being allowed to go free. (Punisher Annual#2 (fb) - BTS) - The events in DC were spun to have been a mass hallucination. (Punisher Annual#2 (fb) - BTS) - Viper was released from prison by "Dr. Tyrone" and took the identity of Leona Hiss, director of the S.O.S. (Save Our Society) movement, offering cures to drug addiction, while mutating their clients into serpentine humanoids with a variant of the Slither serum. Helmut Snead and Ralph Newton were amongst those who became the next generation of Snake Men. (Punisher Annual#2) - The serpentine Ralph Newton was observed by Moon Knight eating a gerbil in a pet store, leading Moon Knight to discover his connection to S.O.S., and investigate further. Seeking out Newton, the Punisher became similarly involved in an investigation of S.O.S. Moon Knight and the Punisher joined forces and, after encountering a number of these Snake Men while tracking down Newton at the Clock Street Clinic, they assaulted the S.O.S. HQ at the Borgwardt Estate, Long Island. While Viper checked on and disciplined a new batch of Snake Men, Punisher and Moon Knight took out the guard Snake Men's thermal packs, causing the cool weather to render them sluggish and easily defeated. Viper leapt atop the Punisher's shoulders, and injected the Slither serum into him. Refusing to submit or collapse, the slowly mutating Punisher became delusional and began firing wildly. Leaving him to battle the other serpent men, Viper found her assistant, Smalto, injected him with a massive dose of Slither serum, and escaped in her rocket as Moon Knight fought Smalto. Ripping off Smalto's thermal pack, Moon Knight beat him into submission. 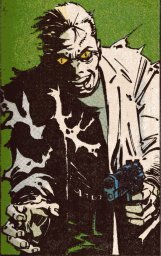 Moon Knight then distracted the Punisher with moonlight reflecting off of his crescent darts, keeping him occupied until he collapsed from drug intoxication and went into convulsions. Moon Knight had the Punisher cared for at his own estate until he recovered from the drugging. (Spectacular Spider-Man Annual#9 (fb) - BTS) - "Dr. Tyrone" opened 200 S.O.S. clinics around the US. (Spectacular Spider-Man Annual#9) - From his West Side S.O.S. center, "Dr. Tyrone used the modified Slither serum to virtually instantly "cure" drug addicts. Tyrannus sent a number of fully-mutated Snake Men against the vigilante Cloak, while Spider-Man observed one of the cured junkies mutating into a Snake Man. Cloak eventually escaped, rescuing Dagger from Tyrannus' clutches (though not before she had received the mark of Set, but Spider-Man was mesmerized and captured by Tyrannus. (Daredevil Annual#4B (fb) - BTS) - Wally Jordan entered the S.O.S. center in Munroe Falls, New York and became one of the Snake Men under the control of Tyrannus. (Daredevil Annual#4B) - Leo Baxter snooped around the S.O.S. facility, hoping to find Wally, but was confronted by a group of Snake Men who wished to halt his investigations permanently. Daredevil arrived in time to save Leo and continued investigating the facility after learning of its activities from Dr. Strange. Inside S.O.S., Tyrannus was preparing to summon a snake god (whom he believed to be Set) when a Snake Man warned him of the intruders. The serpentine Wally confronted Leo as he snooped around the S.O.S. facility, and Wally and several other Snake Men captured Leo, only to be captured themselves by Dr. Strange. Tyrannus was consumed by the snake god, Viper fled, and, without a leader, the Snake Men wandered about aimlessly. Strange cast a spell that returned the Serpent Men to normal. The POTUS and First Lady in Captain America I#344 at the time of print were Ronald & Nancy Reagan. This profile only covers the POTUS & First Lady while they were mutated by the Slither serum. Not all humans serving Viper and Tyrannus during this time were confirmed Snake Men. Brother Elton was only seen as a normal person, so it's not clear if he was a Snake Man that could turn human and back, but I'm leaving him out for now. 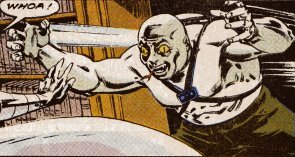 In the Spectacular Spider-Man Annual, Spider-Man saw a tattoo on one of the cultists that he recalled from the encounter with Set worshippers in MTU I#111...even though nobody in that issue is actually shown with such a tattoo. I can only guess he saw somebody with such a tattoo in an event that transpired off-panel during the Defenders' battle with the Set worshippers in the denouement. The Serpent Men (Spawn of Set), a race of snake-headed humanoids, who were the enemies of Omm and the Spider People, were the original offspring of Set, active back in pre-cataclysmic Atlantis, most wiped out by Kull, and later Conan and his son Conan (Conn), @ Kull the Conqueror I#2. The Lizard People, aka the Saurians, such as Serpentyne, @ Ms. Marvel#20, more recently seen in the X-Treme X-Men: Savage Land limited series. Like the POTUS and much of DC, she was mutated into a slightly serpentine form by the consumption of water tainted with the Slither serum. Viper ran past her, considering her unworthy of wasting a bullet on. Wally grew up in the projects in Albany alongside Leo Baxter, and the two became drinking buddies. Wally got his girlfriend Clarisse pregnant and then married her, but he became abusive and eventually became sick from alcoholism. After Wally got out of the hospital, Clarisse made him go to rehab if he wanted to eventually come home to her, but the S.O.S. facility in Munroe Falls, New York, mutated him into one of their Snake Men. When Leo came looking for him, Wally and a group of other Snake Men captured him, but they were then captured by Dr. Strange, who freed Leo. After Tyrannus was defeated and the Viper fled, Dr. Strange magically restored the Snake Men's humanity. Leo tried to convince Wally to get together with him, but Wally realized what a mess he had made of his life and resolved to correct things. After Wally told Leo they had never been friends, but only drinking buddies, Leo tried to shoot him, but Daredevil stopped him. 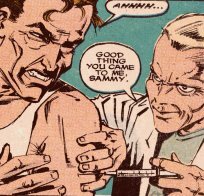 A drug addict who made his living by stealing old ladies' social security checks, he attracted the attention of the Punisher after killing a 70 year old woman by pushing her down a flight of stairs. Newton subsequently went to S.O.S. and was mutated into one of the Snake Men. Using the credit card of S.O.S. member Helmut Snead while purchasing a fresh supply of rodents to feed the Snake Men, Helmut succumbed to the urge to eat one of them right in the pet shop. He was observed by Moon Knight, who followed him to the Borgwardt estate S.O.S. facility before researching the matter further. Having become part of S.O.S., Newton injected others with the Slither serum. He was interrupted in the act by the Punisher and Moon Knight, at which point he took on his Snake Man form and had a number of other Snake Men attack them. He was unfazed by a shotgun blast to the shoulder, but three more to the chest put an end to him. Mutated by consuming water tainted with the original Slither serum, he was encouraged to drink more and more of the water and mutated even further. He attacked Captain America who fought defensively until the POTUS' strenuous activity burned the serum out of his system and he reverted to normal, though he did retain his fangs for a few days. Viper's scientist at the Borgwardt estate S.O.S. facility, he administered the Slither serum to subjects. When the Viper needed to escape, she gave Smalto a massive dose of Slither serum and left him to fight off the heroes. He withstood a lot of punishment from Moon knight, but after his thermal pack was removed, he became sluggish and was easily overpowered.